(Los Angeles, April 22, 2018)—The Los Angeles County Museum of Art (LACMA) announces the addition of 10 new acquisitions during the museum’s 32nd annual Collectors Committee fundraiser. The annual Collectors Committee Weekend—led by LACMA trustee, Collectors Committee Chair, and Acquisitions Committee Chair Ann Colgin—was a two-day affair, which included curator-led art presentations, private dinners at the homes of major LACMA supporters, and a gala dinner where members voted on artworks to add to the museum’s permanent collection. This year, the 96 voting members raised more than $3.1 million. The 2018 event was generously sponsored by Cartier. 1. (Nigeria, Niger Delta, Ijo culture, 19th century), a monumental sculptural figure with seven heads and 14 eyes, emblematic of its role in protecting a community and promoting well-being. This commanding guardian figure is the most imposing and expressive of all known examples, and among the most remarkable works of sub-Saharan Africa. It was the centerpiece of Tradition as Innovation in African Art at LACMA in 2008. With its alert, superhuman vigilance, the forest spirit figure will have prominence in LACMA’s permanent collection galleries, underscoring the multiplicity of visions that LACMA embodies and imparts. Gift of the Silver Family and the 2018 Collectors Committee. 2. 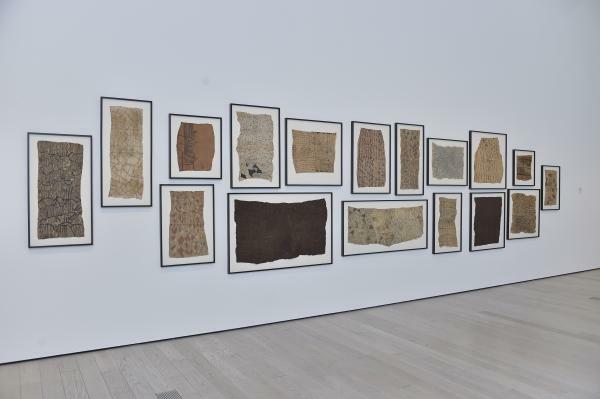 (Democratic Republic of the Congo, Mbuti culture, 20th century) are 29 barkcloth paintings created by nomadic groups of people known as the Mbuti, who reside in the Ituri rainforest. Mbuti men harvest bark from trees and pound them into pliable sheets that serve as painting surfaces for Mbuti women, whose art, with its aesthetics of asymmetry and visual dissonance, mimics the imagery of the rainforest and aligns with the syncopated polyphonic rhythms of Mbuti music. Gift of the 2018 Collectors Committee.